I Can’t Look! You’re Gonna Fall! I have, among other slight psychological disorders, something that I call, Vicarious Acrophobia Syndrome. VAS (which is not included in the the American Psychological Association’s DSM-5, is a very real problem. It means that you have fear of heights for someone else. Just to be clear, I have very real fear of heights for myself. Only in recent years have I gotten to where I can scale a ladder and get onto my own roof, but watching somebody, like this fool sitting on the edge of oblivion in the photo, makes me crazy. I first recognized my struggle with VAS back at Boy Scout camp a number of years back. As an adult, I had been enlisted to help out with an evening’s adventure, guiding boys to scramble up a challenging but not terribly dangerous rock formation. I say that it was not terribly dangerous, but the top of the formation was also the top of a 60-foot cliff. The guys in charge of the outing had me go up the rocks first. “Just keep everyone from going crazy up there,” they told me. To me, the way that you keep from going crazy at the top of a cliff is to hold onto a tree–or better yet lash yourself to said tree–30 or 40 yards away from the edge. Instead, these boys would walk up to the brink of the cliff and stare down into the void. I thought I would die. My rational mind knows that a 12-year-old boy can stand on the edge of something–a rug, for example–look down, and not totter over onto the floor. 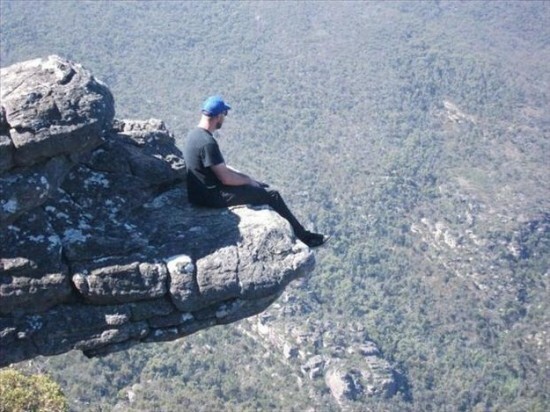 Why shouldn’t he be able to stand on the edge of a cliff? That’s my rational mind, but my VAS-afflicted, emotional mind was going crazy. Why am I thinking about this today? That’s probably fodder for another entry, should I ever get around to it, but thinking about my lifelong struggles with VAS leave me wondering about a struggle I don’t have. Every day, I see people who are standing on the brink of an eternity in hell just as surely as those Boy Scouts were standing on the brink of the cliff. And while those Boy Scouts were not about to suddenly plunge to their deaths, these unsaved people will someday face death and plunge into that doom unless something brings them to Christ. Why do I, the VAS-obsessed guy, not have a similar dread of their very real fate? Why is a highly-unlikely physical risk so much more frightening to me than a completely-certain spiritual risk? I wish I could answer that. More importantly, I wish I could generate the sort of empathy for those standing on the brink of hell that I have for those standing on the brink of a cliff. Prev Why Do Men’s Standards of Beauty Not Shift Like Women’s?